Use one of these DE15 (DBHD15) low-loss VGA/SVGA extension cords to extend the distance between your CPU and your monitor. Built with 75ohm copper wire and polyethylene dielectric, these cords provide accurate picture resolution and color. 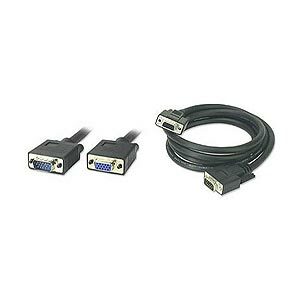 Usually used with SVGA and VGA video signals, this cable features a male DE15 (HD15) 15-pin D-sub connectors at one end and a female version at the other. See the list below for optional sizes. Copyright © 2019 Internetik, LLC. All Rights Reserved.